Carrillo-Briceño J.D. Cadena E. A. Dececchi A.T. Larsson Hans C.E and Trina Y. Du. (2016). First record of a hybodont shark (Chondrichthyes: Hybodontiformes) from the Lower Cretaceous of Colombia. Neotropical Biodiversity. DOI 10.1080/23766808.2016.1191749. Cadena, E. A. (2016). Microscopical and elemental FESEM and Phenom ProX-SEM-EDS analysis of osteocyte- and blood vessel-like microstructures obtained from fossil vertebrates of the Eocene Messel Pit, Germany. PeerJ 4:e1618; DOI 10.7717/peerj.1618. Cadena, E. A. (2015). 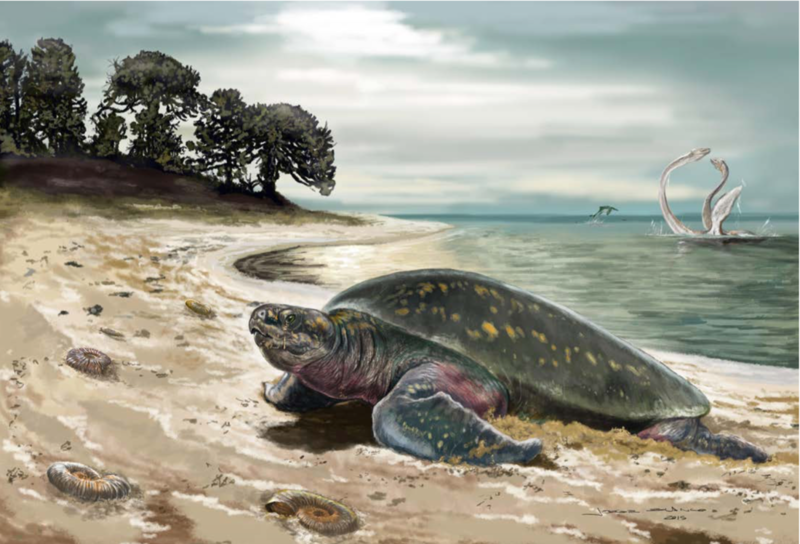 The first South American sandownid turtle from the Lower Cretaceous of Colombia. PeerJ 3:e1431; DOI 10.7717/peerj.1431. ​Cadena, E. A. Anaya, F, and Croft, D. (2015). Giant fossil tortoise and freshwater chelid turtle remains from the middle Miocene, Quebrada Honda, Bolivia: evidence for lower paleoelevations for the southern Altiplano. Journal of South American Earth Sciences 64 190-198. Cadena, E. A. and J. Parham. (in press). 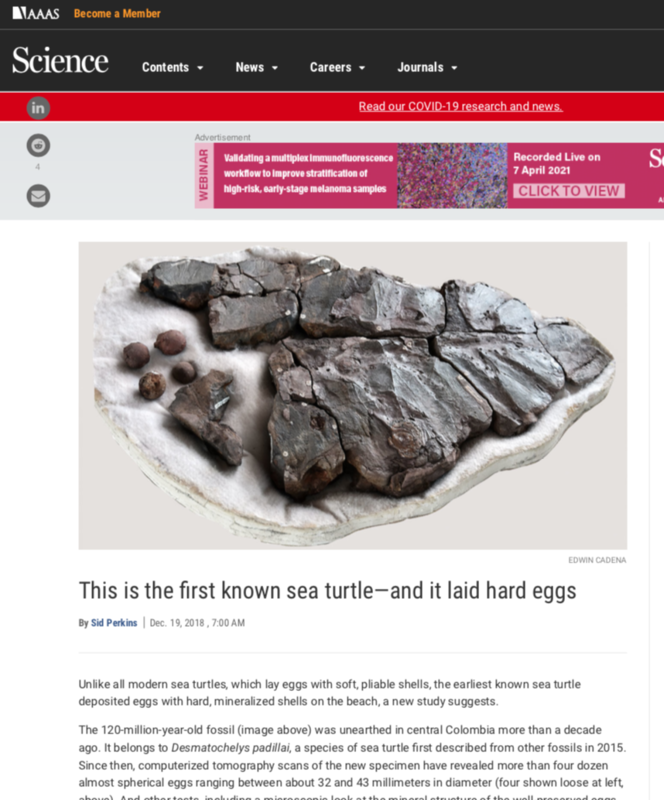 Oldest known marine turtle? A new protostegid from the Lower Cretaceous of Colombia. 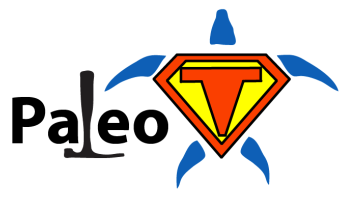 PaleoBios. Cadena, E. A. and C. Jaramillo. (2015). The first fossil skull of Chelus (Pleurodira: Chelidae; Matamata genus turtles) from the early Miocene of Colombia. Paleontologia Electronica18.2.32A:1-10. Cadena, E. A and Joyce, W. J. (2015). A review of the fossil record of Stem-Pleurodiran Turtles. Bulletin of the Peabody Museum of Natural History 56(1):3-20. Cadena, E. A. and C. Jaramillo. (2015). Miocene turtles from the northernmost tip of South America; giant tortoises, chelids, and podocnemidids from Castilletes Formation, Colombia. Ameghiniana 52:188-203. Cadena, E. A., and M. Schweitzer. (2014). Preservation of blood vessels and osteocytes in a pelomedusoid turtle from the Paleocene of Colombia. Journal of Herpetology 48(3):125-129. Cadena, E. A. (2014). The fossil record of turtles in Colombia; a review of the discoveries, research, and future challenges. Acta Biológica Colombiana 19(3):333-339. Cadena, E. A., D. Ksepka, and M. Norell. (2013). New material of Mongolemys elegans (Testudines: Lindholmemydidae) from the Late Cretaceous of Mongolia with comments on bone histology and phylogeny. American Museum Novitates 3766. 27 p.
Cadena, E. A., D. Ksepka., C. Jaramillo, and J. Bloch. (2012). New pelomedusoid turtles (Testudines, Panpleurodira) from the late Palaeocene Cerrejón Formation of Colombia and implications for phylogeny and body size evolution. Journal of Systematics Palaeontology 10(2):313-331. Cadena, E. A. (2011). Potential earliest record of panpodocnemidid turtles, from the Early Cretaceous (Valanginian) of Colombia. Journal of Paleontology 85:877-881. Cadena, E. A., (2011). 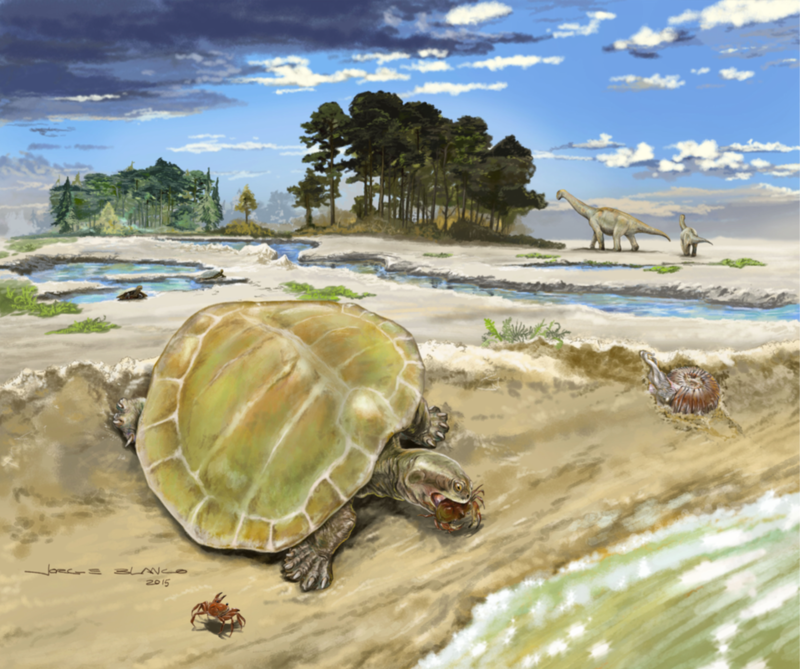 First record of eucryptodiran turtles from the Early Cretaceous (Valanginian), at the northernmost part of South America. South American Journal of Herpetology. 6(1) 49-53. Cadena, E.A., J. Bloch and C, Jaramillo. (2010). New Podocnemidid turtle (Testudines; Pleurodira) from the Middle-Late Paleocene of Tropical South America. Journal of Vertebrate Paleontology 30(2):367-382. Head, J. Bloch, J. Hastings, A. Bourque, E. Cadena, E. A, Herrera, F. Polly, D and Jaramillo, C. (2009). Giant Boine snake from a Paleocene Neotropical rainforest indicates hotter past equatorial temperatures. Nature, 457 (7230) 715-717. Cadena, E. A., Jaramillo, C and Paramo, M. (2008). New material of Chelus colombiana (Testudines; Pleurodira) from the Lower Miocene of Colombia. Journal of Vertebrate Paleontology 28(4):1206-1212. Cadena, E. A, and Gaffney, E. (2005). Notoemys zapatocaensis, a New Side-Necked Turtle (Peurodira Platychelyidae) from the Early Cretaceous of Colombia. American Museum Novitates, 3470:19 pp.